If I can work squash into every meal this season I will. I think autumnish (why is spellcheck telling me “autumnish” is not a word? 🤔) foods are the best and I basically use the same flavors and ingredients in various forms and combinations. You can expect more squash, pork, sage, and fennel recipes! We went to a couple Halloween parties (yeah, we’re SO popular) and I brought this stew along. I didn’t write down any ingredients while I made it (that would have been too smart) but enough people said they really liked it or wanted the recipe. So as these things normally go, I’m putting it here from memory and hoping it’s basically the same thing that I did originally! I usually always remember the ingredients – it’s more so the amounts of fresh herbs, dried spices, or other seasonings that may be a bit off. When in doubt, add more. We want flavor here, people! Oh and while it’s obviously always fine to use a store-bought broth, especially if you’re in a rush, getting in the habit of making some homemade broth really kicks things up a notch. I know I’ve said that in other recipes as well. And I’m saying it again here! And I’ll yell it from the rooftops! A thing I’ve been doing lately with soups that involve pork is using a mix of beef and chicken broth. For some reason pork seems like a mix between red and white meat (even though it’s “the other white meat”). The actual reason I’ve done that though is because I didn’t have quite enough chicken broth so I added beef. It worked well so now it’s my thing. And it can be your thing too! It’s all real, whole foods. That is priority number one with the Healthy Pursuits “diet.” No preservatives, artificial flavorings, colors, flavor enhancers, or any weird chemicals. 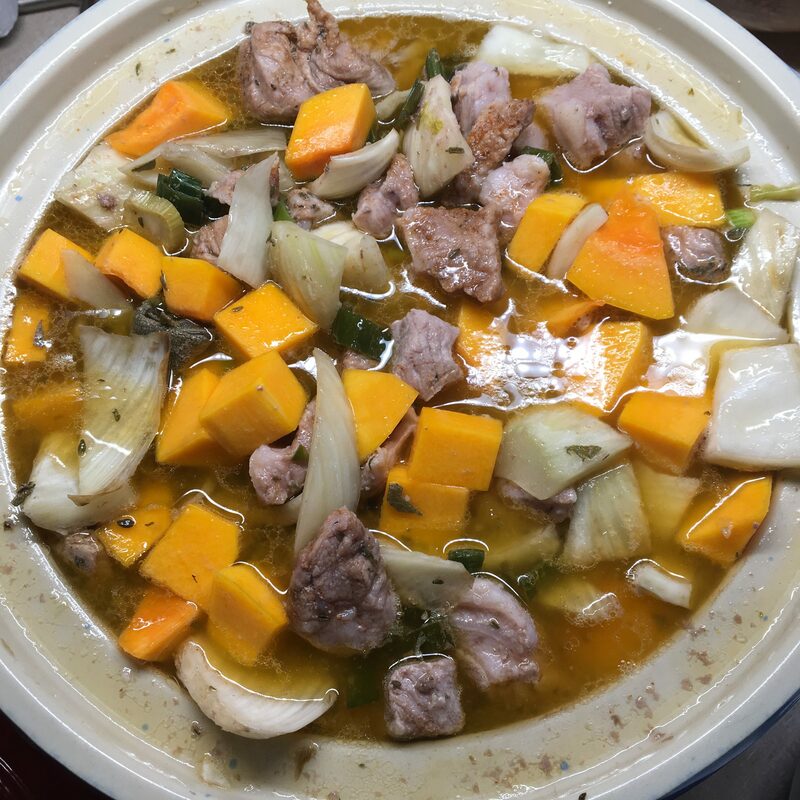 Meat, vegetables, broth, herbs, and some natural fats. 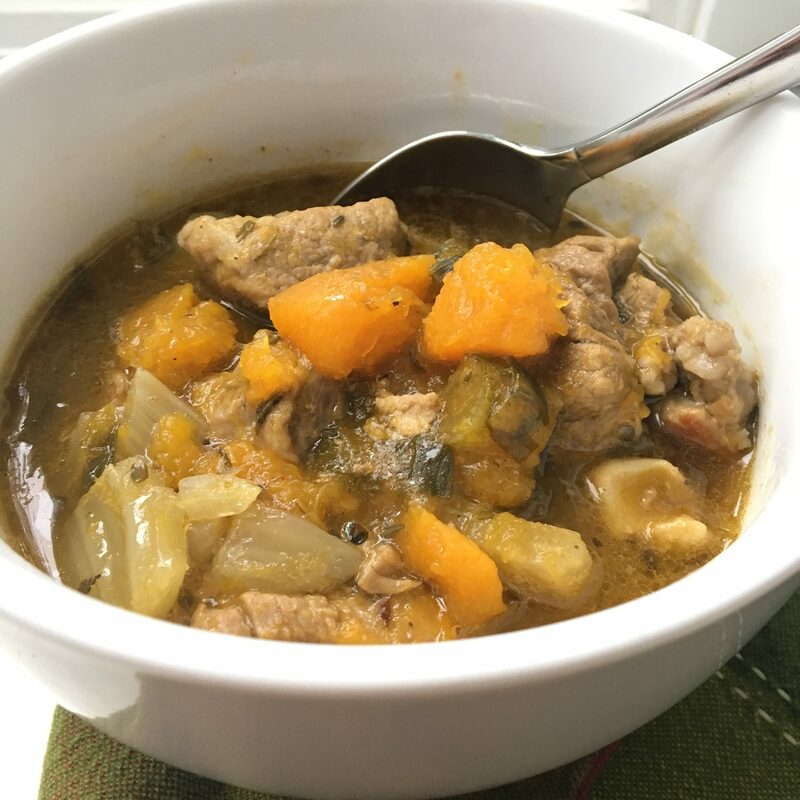 The homemade chicken and beef broth is rich in easy to absorb minerals, collagen, and amino acids. Actually, I’d say it tastes good for the same reasons it’s healthy! Real food does taste good when it’s prepared with lots of flavorful ingredients! Preheat oven to 250 degrees. Heat a large, oven-safe pot over medium heat. Sprinkle salt, pepper, and coriander on the meat. Once the pan is hot, brown the pork chunks on all sides, working in batches if necessary. Remove from the pan when they’ve been browned. Add the ghee (or other fat) to the pot and once melted add the squash cubes. Sprinkle those with some salt and pepper as well. Allow them to brown a bit on a couple sides and then remove from the pan. Add the sliced fennel, garlic, herbs and dried seasonings and stir to combine. To get the tasty brown bits that may be on the bottom of the pot, add your glug of wine, vinegar, broth, or water and scrape up anything stuck on the pan. Then add the pork back to the pot along with the broth. Bring to a simmer and then place in the oven for 1 hour. After an hour, add the butternut squash pieces and cook for another 1.5 to 2 hours. Taste and add any additional salt and pepper that is necessary! This is what happened the second time I made this and tried it in the Crockpot. Got a little ahead of myself with the amount I thought would fit!